In the last decades of the 20th century, history teaching in Bosnia-Herzegovina, Croatia and Serbia, in terms of methods used in education, was undergoing progressive changes compared to socialist period, and the topic were more focused on political history. New methods and contents, activating the pupils, are the final result of this project. The idea was to come up with the supplemental and innovative material for history teaching, which would represent positive example (through its contents and methods), and which corresponds to the demands of history teaching at the beginning of the 21st century and perspective of strengthening regional cooperation. Exchanging experiences with experts from Denmark, Netherlands, Slovenia, Macedonia, Switzerland, Russia, Great Britain and other european countries, a group of historians and history teachers from BiH, Croatia and Serbia improved own knowledge and skills for implementation of a creative and modern approach in history teaching, in accordance with democratic principles. Participants in the project shared their experiences with the colleagues through workshops and numerous seminars they organized and to which they participated in the region and in Europe. 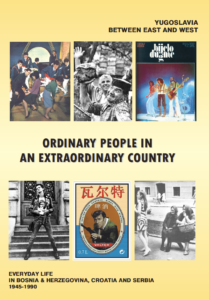 The book Ordinary People in an Extraordinary Country, Yugoslavia between East and West Every-Day Life in Bosnia and Herzegovina, Croatia and Serbia 1945-1990 is a product of intense peer-learning and cooperation. Through collaborative writing of the authors group, 20 different multi-perspective and ready-to-use workshops allow students to approach the history of the socialist Yugoslavia. It was published in 3 local languages on February 1st 2008. In August 2008 the book became also available in English. Altogether 2500 full colour copies are printed. The Macedonian Chief Editor accomplished a difficult but rewarding task by streamlining the 4 publications from concept to postage. The main targets of the publication are to offer innovative knowledge and subject methodology on teaching the history of Yugoslavia between 1945 and 1990 in schools and to improve the quality of history education and teacher training in the region. The publication Ordinary People in an Extraordinary Country can be considered as the main evidence of the high quality outcomes of the intense training programme of the key group. In the project evaluation knowledge about new methods in teaching history was mentioned by almost all project participants as one of the major outcomes of the project. In the four years of the project, more than 500 participants were active in various activities such as seminars, workshops, study trips, lectures, international conferences and training. Thanks to that, they developed new skills and ideas, at the same time giving big contribution to the quality of the project.